Alnmouth sits on the beautiful Northumberland coast a little to the east of Alnwick. It has been here since the 12th century and offers tremendous value for any visitor. Let’s talk about what you can do. 1. The bay itself is sandy and clean. There is good car parking alongside the golf course and it is also only a short walk from the shops and hotels. 2. The village itself has the Schooner hotel which has been there at least 400 years and naturally has many ghost stories to frighten it’s guests with. 3. The golf course is relatively small and only nine holes but what a setting right beside the beach. 4. There is an arts festival every June with lots to see and do. 5. The Red Lion Inn offers a raised timber deck where you can take your pub lunch and drinks whilst you watch the boats sail up and down the estuary. 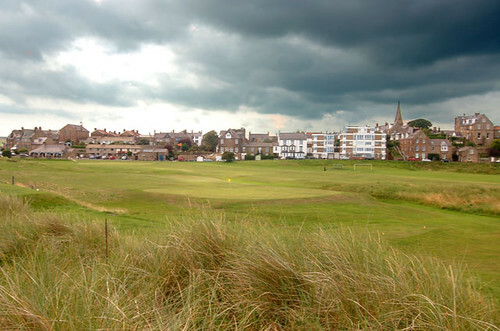 If you chose to holiday in Alnmouth then you will be very close to lots of other attractions. Alnwick with its castle and gardens is only 10 minutes inland. A little way to the south is Amble and Warkworth with their castle and genteel streets. To the north is RAF Boulmer and then the coast starts to get more rocky as you come to Craster, with its kippers and the magnificent ruins of Dunstanburgh castle. This picture shows the view from the bay looking over the golf course towards Alnmouth itself. This article was written by Mike Holly shortly after he was exploring holiday cottages around Alnmouth.